There was an interesting discussion on the radio this morning about the so called ‘Ten thousand hours principle’. We heard a lot about this around the Olympics- leading to a general feeling that success in any given pursuit is related to one main thing- sufficient application. Time spent over and over again practicing, rehearsing, developing skill, muscle memory and endurance. 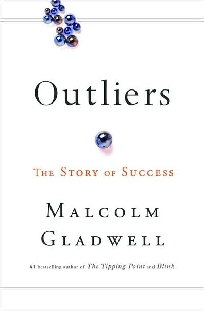 In Outliers, Gladwell examines the factors that contribute to high levels of success. To support his thesis, he examines the causes of why the majority of Canadian ice hockey players are born in the first few months of the calendar year, how Microsoft co-founder Bill Gatesachieved his extreme wealth, how The Beatles became one of the most successful musical acts in human history, how Joseph Flom built Skadden, Arps, Slate, Meagher & Flom into one of the most successful law firms in the world, how cultural differences play a large part in perceived intelligence and rational decision making, and how two people with exceptional intelligence, Christopher Langan and J. Robert Oppenheimer, end up with such vastly different fortunes. Throughout the publication, Gladwell repeatedly mentions the “10,000-Hour Rule“, claiming that the key to success in any field is, to a large extent, a matter of practicing a specific task for a total of around 10,000 hours. Success is thus democratised. With the right amount of hard work we can all succeed; we can climb the highest mountain, pass the exams, win the recording contract, make our first billion. The American dream has been quantified. I do not want to squash your ambition; if you are aiming high, may success light your days, fickle though it will surely be- there is after all always another mountain beyond. My issue however is that the whole ten thousand idea is hogwash. Some of this is about the relationship between application and ability. The nature of the kind of success we value is that it is a rare commodity, achieved by people with extraordinary ability. These people are out on the far edge of the bell curve- gifted with ability to run, climb, reason, sing, dance etc. Sure, in order to scale their own possibilities they need to work hard, make sacrifices etc, but do not pretend that their success was actually available to all, it simply was not. Next, most of the successes that are quantified in this book are the ones that can be measured in terms of two things- celebrity and money. There is a nod to academic achievement too, but pretty much this is a marginal matter. It is success within a very specific context- democratic market capitalism. In order for our continued buy-in to our zeitgeist, we have to believe that the glittering gifts of our culture are available to us all, without exception. Happiness and fulfillment- what do we know about them? Do people who succeed have a higher measure of these things, or a lower one that drives them on? Are they satisfied with their success? And where does that leave the rest of us scrabbling in their wake? I think the answer to this is that success is not closely associated with happiness. This comes from a gentler kind of human being-ness, better understand as living in harmony and connection with each other. It is more about commonality than ascendancy- and a far better use for our ten thousand hours. It might also be that even though most of us are ‘ordinary’ in the reach of our achievements, the value of what we are has nothing to do with celebrity or bank balance. There is such beauty in small things, in moments of grace, in every day loving. This entry was posted in Uncategorized and tagged Malcolm Gladwell, Outliers, success, ten thousand hour rule by Chris Goan. Bookmark the permalink. ‘there is such beauty in small things’ I wish more people would realise that!